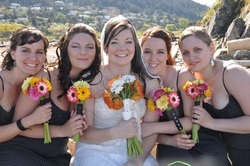 Bridal Bouquet -- 12 beautiful gerbera daisies create this bouquet! Many colours available. Two Bridesmaid Bouquets -- Two smaller bouquets made with either 7 full size gerberas or 11 mini gerberas. Flower Girl Bouquet -- 5 gerberea daisies. Could be used as a guest book arrangement as well. Boutonnieres -- 5 mini gerbera boutonnieres for your groom and others.